Come out and enjoy some delicious hot soup, bread, great company and an awesome film! 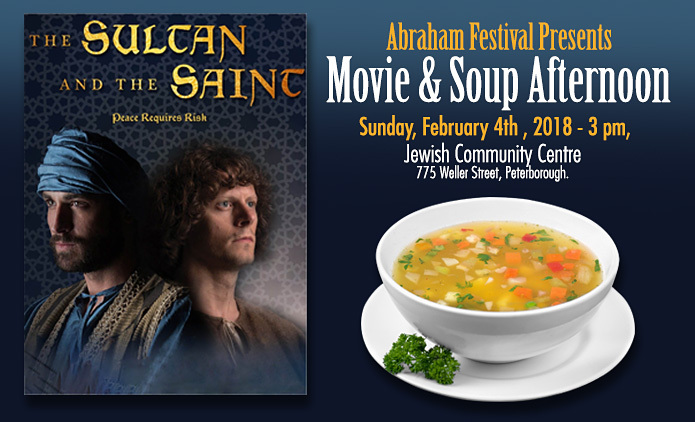 Sunday, February 4th, 2018 – 3 pm, at the Jewish Community Centre, 775 Weller Street, Peterborough. The Sultan and the Saint tells one of the great lost stories from history. It is a story of two men of faith, Francis of Assisi, a would-be knight turned itinerant Christian preacher and the Sultan of Egypt, a forgotten Muslim prince steeped in Islamic learning by his mother and raised in the palace, and their meeting on a bloody battlefield during the Christian-Muslim conflict known as the Crusades. This is the story of their meeting that bucked a century of war, distrust and insidious propaganda in search of genuine mutual respect and common ground – and changes history.